Jul 17, 2017: Etekcity wifi mini outlet? Aug 18, 2017: Who wants to take bets on this having an esp8266 in it? Aug 28, 2017: Control Etekcity smart plugs without official app or Alexa? Oct 04, 2017: How do I schedule devices (or groups of devices) through Alexa? Dec 14, 2017: Etekcity for Christmas lights never online. Jan 09, 2018: Just got 2 wifi outlets for space heaters in different rooms. Can I use Tasker or IFTT to cycle them? Jan 13, 2018: Does anybody have anything to say about the Etekcity wifi plugs? 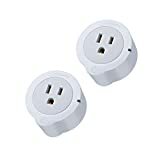 Jan 17, 2018: Etekcity 2 Pack Voltson WiFi Smart Plug Mini Outlet with Energy Monitoring, Works with Amazon Alexa Echo and Google Assistant, No Hub Required. Price: $59.99 With Deal: $26.99. Jan 18, 2018: How do I check how much electricity I am using? Mar 19, 2018: Smart Plugs - What's the best bang for the buck? Mar 22, 2018: Is there a Kill A Watt type device that is bluetooth etc that will log the electricity usage for an outlet? It's for tax reasons. Mar 20, 2019: A sorta Google Home puzzle. How can I get my TV to turn off when the screensaver is active?